Arrangements are completed with my farmer, James Davidson, to have the sheep delivered at the White House as soon as possible--ten coming yearling ewes and four old ewes with their lambs, the lambs to be as young as can reasonably stand the trip. They will come by wagon, and instructions have been given to ask for you and to indicate at the gate that the sheep come from Belair Farm and are for the President. Shearing time is on at the farm, and as they would look something like picked chickens if shorn, I gave instructions not to shear them, but to trim them up so that they will look nicer. They should leave the farm to-morrow morning, but this rainy day may delay them a day, as the road is a country road and might be too heavy after a rain, and furthermore my farmer is a hardy Scotchman who has a will of his own, and for one reason or another he may be a little slow, but I instructed him and urged him to let no grass grow under his feet, and I think you will have them in hand in a day or two. I enclose a little photograph taken last October at the farm, which may be of interest to the President as showing the sheep in their native pastures at “Belair”. It is a great pleasure to have this opportunity. 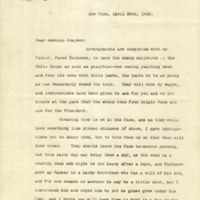 Woodward, William, 1876-1953, “William Woodward to Cary T. Grayson,” 1918 April 29, WWP15472, Cary T. Grayson Papers, Woodrow Wilson Presidential Library & Museum, Staunton, Virginia.